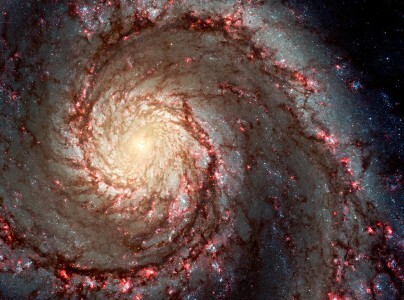 Spiral galaxy M51 is better known as the Whirlpool Galaxy. The blue areas are star clusters and the pink represents areas where new stars are being formed. The galaxy’s stars are enshrouded in heavy dust making them difficult to see. However, this jigsaw puzzle shows the stars more clearly than earlier photos of the M51 galaxy because the photo is actually created from a combination of multiple photos from NASA’s Hubble Space Telescope recording different wavelengths of light. Credit: Special thanks to NASA Goddard Space Flight Center for making the photograph used for this jigsaw puzzle available through the Creative Commons Attribution license. Visit NASA Goddard Space Flight Center's Flickr photostream. See all jigsaw puzzles based on NASA Goddard Space Flight Center's photographs.